When fall rolls around, we cannot resist having a bowl of this snack mix hanging around in the kitchen! There is something undeniably delicious about a mix of peanuts and candy corn! It’s a small party in your mouth!…and then throw in a little more sweet (the m&m’s) with just a tad more salty (the pretzels) and you will be addicted! This makes a really big batch, so it’s fun to make up a few jars and drop a jar off at the neighbor’s house or even hand a jar to a teacher or coach! A simple “for no reason” gesture! Directions: Poor all ingredients in a bowl and mix. 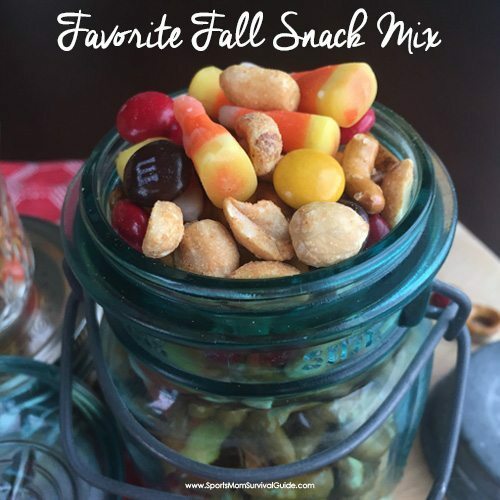 I love making this Favorite Fall Snack Mix when we have guests over, it’s a perfect treat to munch on! Need another great snack mix idea? The Kids’ Favorite Snack Mix is always a hit! Poor all ingredients in a bowl and mix.